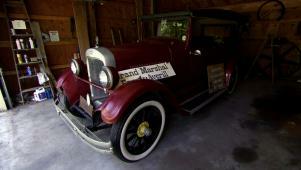 This time on Cash & Cari, a packed farmhouse poses a major challenge for Cari and the estate sale team. And, from musical instruments to a 1925 Studebaker, everything's got to go. The emotional owner has mixed feelings about liquidating her late father's collection. But a wheelin' and dealin' Cari is determined to reward her with a handsome profit instead. Also in this episode: Cari agrees to pay thousands for the contents of an entire home. But will she uncover enough treasures to justify the monumental cleanup? A rare vintage stove gets banged up on the way to the warehouse. And, back at the shop, a hopeful collector comes in with an Impressionist painting. But is it a real Degas? From musical instruments to a Studebaker, it's all got to go at this sale. From: Cash & Cari with Run Studebaker Run!